← Columbia: Ride to Travel or Travel to Ride? Cali, Colombia, Containers, Cats, Cane, Coffee and Cablecars. I think I have covered all the ‘C’s and yes they are in sequence. The first two are fairly obvious, we are in Cali, Colombia. The others will be revealed in due course as this blog entry unfolds. Our priority in Cali is to find and understand the options available to us for transporting our bikes to Panama or beyond. The demise of the ferry between Cartagena and Colon in Panama last week has put all options on the table. They include small sailing ships, containers, RORO ferry and airfreight. The internet has provided us with a great source information as we have travelled and like our GPS we have come to rely on it. A problem occurs for us when the information found is inaccurate, mostly due to the passage of time. We also need to consider the author and their interpretation of what they are recording, as our views in this blog are influenced by who we are and our experiences. We have also found instances where inaccurate information has been copied or linked in good faith and repeated a number of times. It therefore gains authenticity and credibility when undertaking a Google search. In our case the ferry demise is so recent that Anne’s information, which she shares on a travelling forum, is some of the most current. Anne researches and sends 19 emails, many are not answered, but as time progresses we learn some interesting facts. If you are using the RORO ferry, remove your number plates as they are considered souvenirs. No we did not pack a spare set, we must remember for next time. The Colombian police will search every vehicle for drugs, including dismantling your car/bike so that means we will probably have to unpack and repack everything. We understand that takes hours to do. Sailing boats are not permitted to take motorbikes, probably to assist the now defunct ferry operator, this will change in due course but we cannot wait weeks or months for this to happen if we are to complete our journey on time. After days spent researching, emailing and checking, we have decided that we will airfreight the bikes. While this is the most expensive option, but the quickest, we have no idea on port costs in Colon and our previous experience of port costs is that there are always a few more added on when you get there. We also avoid having to visit Colon and its port in Panama, which does not have the best reputation. We and the bikes plan to depart on the 9th of May for Panama by air at this stage from Medellin, where we will go next week. Well that took a few paragraphs to describe and three days to sift through the information. We now need to come up with some 8 million plus pesos as they only accept cash. Off to the ATM each day to stock up each day. Cali is a modern city, but has used some old facilities well. The old railway maintenance buildings have been turned into a modern open air shopping centre. 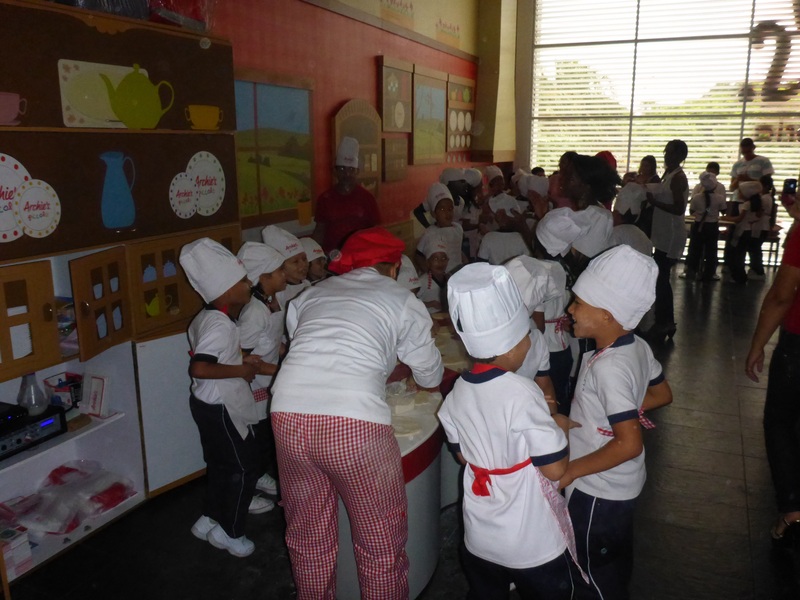 Here we found an unusual restaurant that had a section where kids could learn to cook, pizzas it seemed, and parents could shop without having to drag small unwilling shoppers around with them. Good idea. People have been so helpful: apart from the motorbike pushing over the bridge, we have had someone take us a couple of blocks to look for a camera battery. A restaurant manager in Cali on hearing that Anne was allergic to cream and cheese, came to us with the whole menu ingredient list to make sure her choice was safe. A restaurant owner in Pasto, although rushed off his feet, was so attentive towards us, it was as if we were the only guests. When we took a wrong turn down a dirt track for 3kms looking for our accommodation, a young couple who we approached offered to hop onto their motorcycle to show us the way. Cab drivers in Cali rounded our fare down, not up, on several occasions!! 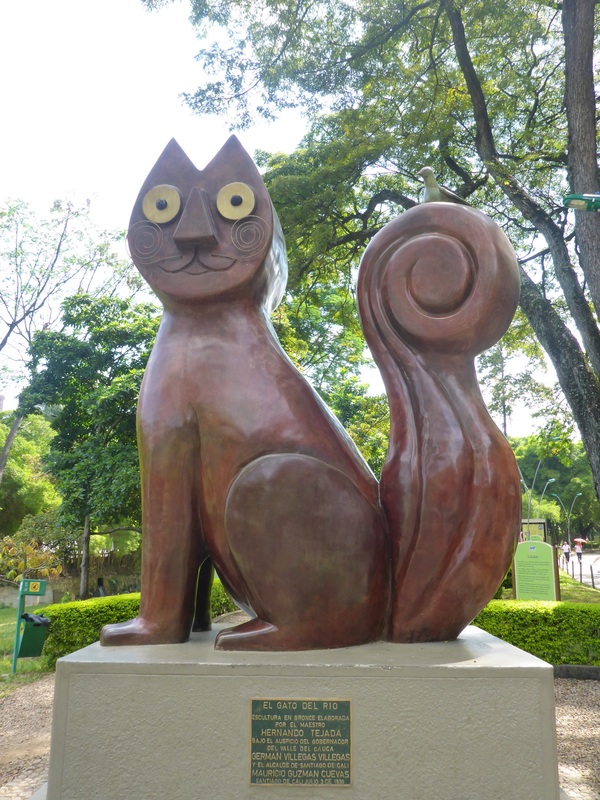 This cat has 19 small cats painted by local artists situated nearby for company. Leaving Cali is straightforward, apart from my soft pannier rubbing up against a car as we tried to cross four lanes of traffic in a tunnel, no damage done, but an unhappy driver. Cities are not our favourite driving places and we were glad to be out and heading past the many fields of sugar cane. Well that’s five ‘c’s, only two to go. 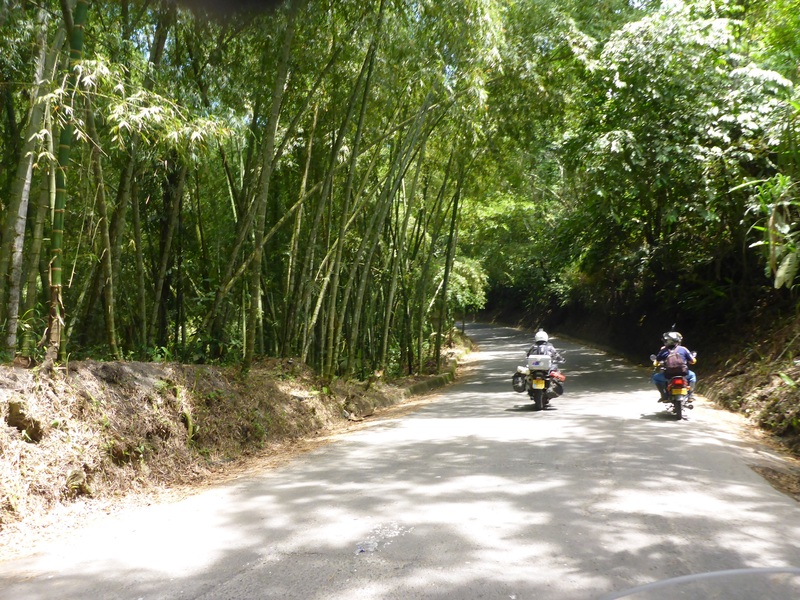 We can smell the sugar cane as we pass the processing plants and a sweet honey smell from the large tress with pink flowers that overhang the road in places. We are heading for coffee country. Columbia is famous for its coffee, although I understand from reading somewhere that Colombians prefer chocolate as a drink to coffee. Having seen the number of ice-cream sellers, I think there is a sweet tooth here. We are going to stay near a town called Montenegro but first will stop at the Parque del Café. This is a combination of coffee museum and amusement park set on a hillside overlooking a lush valley with the city of Armenia in the distance. 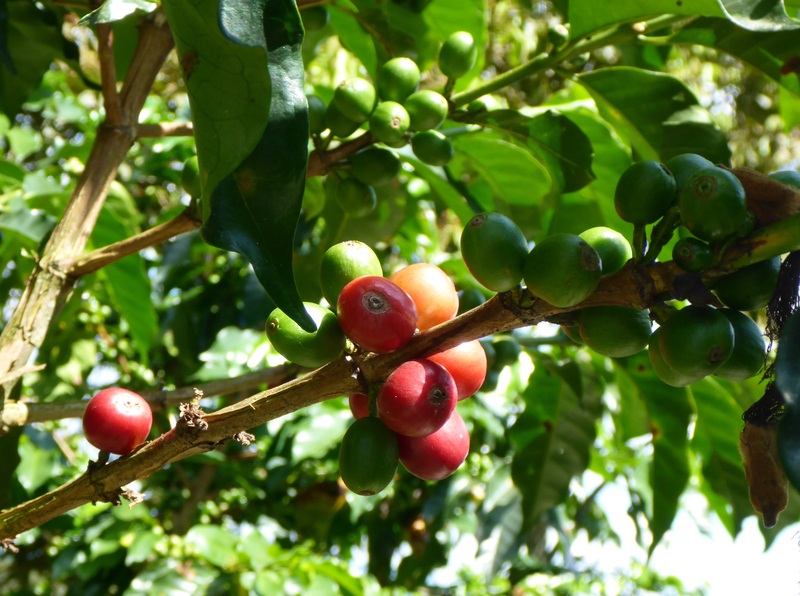 The coffee history is very interesting in this region, we learnt of the introduction of the coffee bush to the Americas between 1710 and 1725. The development of coffee as a major export product and the large employment it has generated saw the establishment of the Colombian Coffee Growers Association (FNC) a coffee co-operative in 1927. Many coffee farms are family run and FNC works to ensure that the 560,000 families that work in the coffee industry have a market for their product at the best price, help develop markets worldwide for 100% Colombian coffee and undertake on-going research. A short 3D movie in the museum even had a coffee smell, which I love, introduced into theatre to help us appreciate coffee more. Sadly even with all this great information and marketing, I have not been converted to a coffee drinker, so it failed to gain another convert. I will stick to green tea. 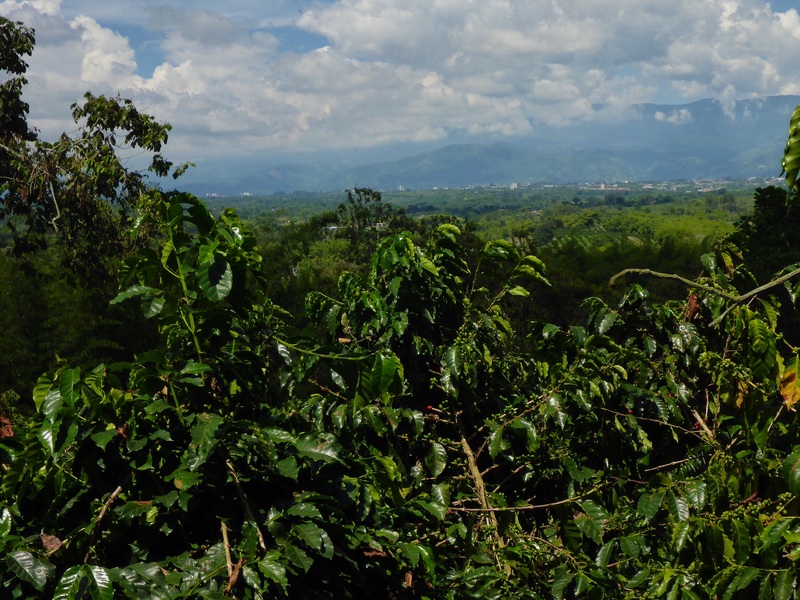 We are able to see a variety of coffee plants, both Colombian and Arabica planted on the hillside as we meander down to the amusement park section..
We “brave adventure riders” decline the -5% rollercoaster for the more gentle railway ride. We get enough excitement on the roads each day! Returning to the top of the park, we take the cable car back to the top. I am pleased to see that the cable car system is from Switzerland. I prefer to know that something important like this comes from a manufacturer in a mountainous country with a long pedigree. I am a coffee addict so I think you have just found heaven for me. As I’ve said before; there are good and bad wherever you go. Somehow you both usually manage to find the good people who are proud of their country, ensuring that all visitors leave with happy memories. The poorer the country, the more generous and friendly the people it seems. Pleased to hear you have managed to get your bikes sorted. And so on to the next leg of your fascinating journey.